It's the moment you've all been waiting years and years to read. It's the end of the long path the ronin father and son have been on since the boy's birth. Through unimaginable violence and bad weather, across hundreds of miles of blood-soaked roadbeds, over years of tragedy and anguish, to this final 320 pages of still-epic story, Itto and Daigoro have kept us holding on to what little hope exists in a world where honor is all but forgotten and warriors are obsolete. It's a bloody battle all the way to the finish, with dramatic twists and turns right up to the final page. 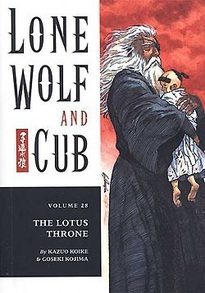 Stay with us as we conclude the translation of what will always be considered one of the finest examples of comic-book mastery ever created, Lone Wolf and Cub.